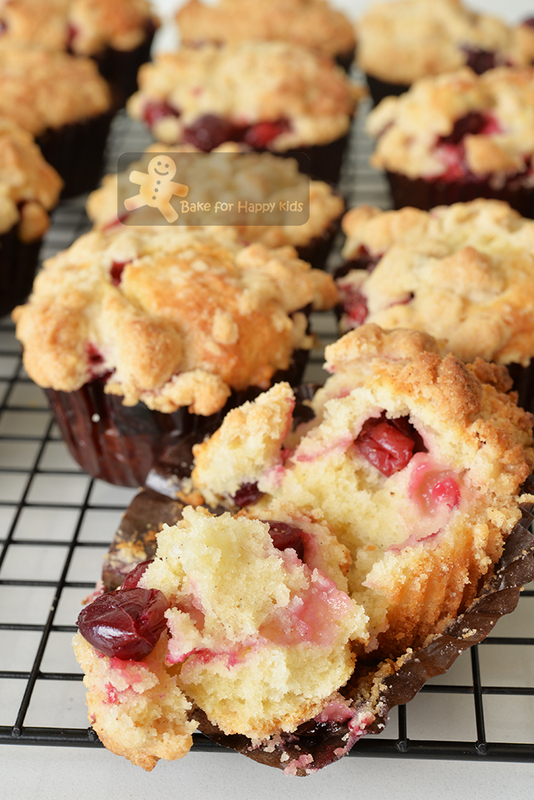 Bake for Happy Kids: Cranberry Buttermilk Streusel Crumble Muffins - HIGHLY RECOMMENDED especially for Christmas!!! Cranberry Buttermilk Streusel Crumble Muffins - HIGHLY RECOMMENDED especially for Christmas!!! As always, I love baking with cranberries for Christmas. 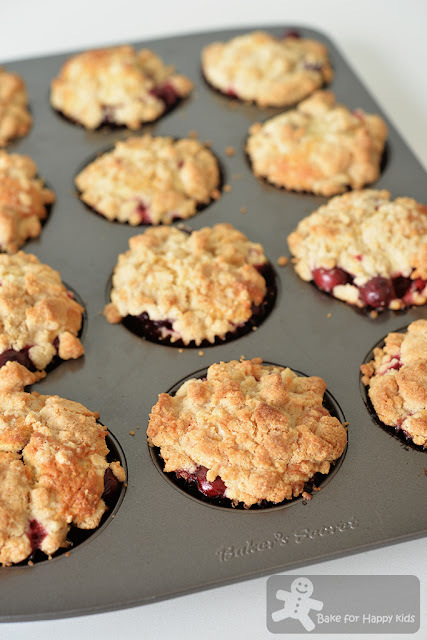 And this time, I have used my favourite BEST Blueberry Buttermilk Streusel Crumble Muffins at here to bake these awesome Cranberry Buttermilk Streusel Crumble Muffins. Awesome? Trust me... These cake-like muffins with buttery a little salty a little crispy streusel are not overly sweetened and yet the juicy fruity buttermilk tang in them is making them awesomely delicious! HIGHLY HIGHLY HIGHLY RECOMMENDED for Christmas! I love this recipe because it is so versatile and can make very delicious muffins. 1) I can use this recipe to bake with any other fruits or berries such as coarsely chopped strawberries, cherries, raspberries, pineapple, peaches, apricots and etc but the fruits have to be either fresh, canned (thoroughly drained) or frozen. No dried fruits because they won't make the muffins moist and juicy and they will make the muffins too sweet. Can't find fresh or frozen cranberries? No sweat and worries! I reckon using strawberries, cherries or raspberries will make these muffins look very Christmasy too! 2) I can mix this cake-like muffin batter with or without using an electric mixer. Watch my video to see how I mixed mine using a wooden spoon. Easy peasy!!! I can't wait to feast on one of these freshly baked buttery juicy cranberry muffins. Are you drooling at these super yummy muffins? Why wait? Bake them now or for Christmas! Here's the versatile recipe that has been re-written from here. *Original was 150g, 3/4 cup but the sweetness made from 100g is just right for us. ** If unavailable, substitute with 120ml (1/2 cup) milk with 1/2 tbsp vinegar or lemon juice or unsweetened natural yogurt with 4% fat. If you are using the milk and vinegar mixture, mix and rest mixture for 10 mins in order for it to thicken and curdle. Nevertheless, I have to say that buttermilk works the best! *** If unavailable, please see the tips above before the recipe. Wash and dry the berries well if you are using the fresh ones. Do not thaw if you are using frozen fruits. In a medium mixing bowl, combine flour, sugar, baking powder, salt and cinnamon. Add butter and stir with a fork until the mixture looks crumbly. Using your fingertips, squeeze the mixture gently together to form larger lumps, then break them apart with your fingertips. Allow streusel stand for about 15 mins. Cut the butter into 2-3 cm (1 inch) pieces and place in the bowl of the electric mixer. Add lemon zest and mix on medium speed until smooth and lightened in color, about 1 min. While mixing, add sugar in a steady stream, then mix in the egg and vanilla, scraping down the side of the bowl as needed. From this step onward, reduce the mixer speed to low or use a spatula to mix. Combine flour, baking powder, baking soda and salt. Sift and mix in one-third of the flour mixture, then stir in half of the buttermilk. Repeat this sifting and mixing step with the remaining flour mixture and buttermilk, mixing the remaining one-third of the flour mixture last. Mix well after each addition until mixture is just combined. Do not over-mix. Cut the butter into 2-3 cm (1 inch) pieces and place in a large mixing bowl. Add lemon zest and use a wooden spoon to beat for about 1-2 mins or until mixture is smooth. Add sugar gradually in about 7-8 small batches and mix well to incorporate after each addition. Then, add roughly beaten egg bit by bit and mix well too after each addition. Mix vanilla into the mixture. Combine flour, baking powder, baking soda and salt. Sift and mix in one-third of the flour mixture, then stir in half of the buttermilk. Repeat this sifting and mixing step with the remaining flour mixture and buttermilk, mixing the remaining one-third of the flour mixture last. Mix well after each addition until mixture is just combined. Do not over-mix. You will notice that the muffin batter is rather the firm kind. Divide batter into half and then 12-14 portions and scoop each portion into the prepared pan. 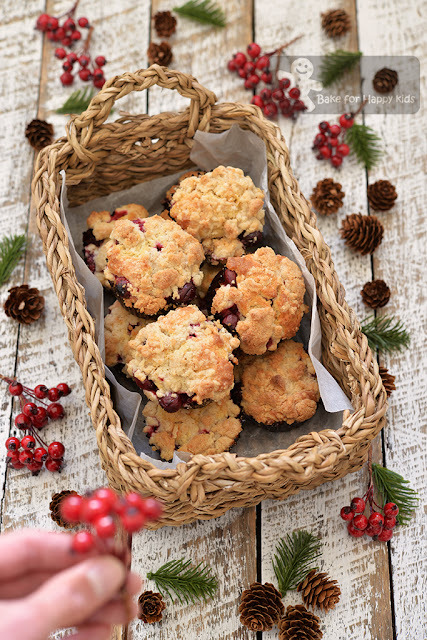 Distribute cranberries evenly over the batter, then place the remaining half of the batter on top of the berries. It’s okay for the berries to show. Divide streusel topping into 12-14 portions and crumble each portion over the batter and berries. Press gently to adhere. Use a small pastry brush to brush off any stray crumbs from the top of the muffin pan if required. Bake for 25 to 30 mins (must be at least 30 mins if you are using frozen berries) or until the streusel topping is golden brown. To ensure even baking, towards the end of baking time, rotate the pans top to bottom and front to back. Remove from the oven and place on a rack to cool slightly for 10 mins and transfer the muffins onto a wire rack to cool completely.